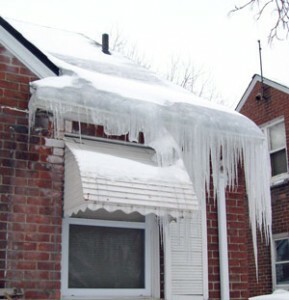 Ice Dams, Frozen Pipes and burst water pipes are serious winter water damage issues. Cold air does a lot more than annoy people: it can wreak havoc on your plumbing and heating systems if they are not properly maintained, causing costly and extensive repair. Rapid Recovery works with home & business owners to fix damage caused by Winter Ice damage, collapses roofs, frozen pipes or burst water lines. While no homeowner enjoys making repairs to his or her home, winter is most definitely the worst season in which to attend to these. One of the top restoration issues during winter involves burst pipes which often leads to collapsed ceilings as well. Burst pipes can cause severe damage: not only will the heat not operate properly in your home, but once the pipe breaks, you have an active leak and need immediate service. If the leak is not stopped in an adequate amount of time, you will need to not only fix the broken pipe; you’ll be fixing any ensuing structural and water damage as well. What causes a burst or broken pipe? 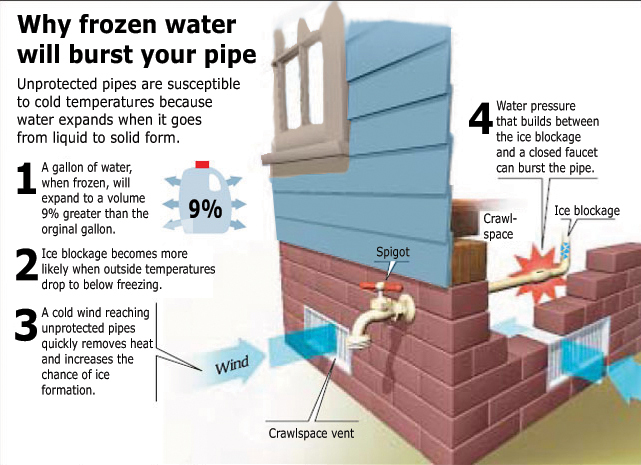 Generally, when a pipe bursts, it has been exposed to freezing temperatures due to its location (i.e., exposure) or the insulation that is on, or around, the pipe has failed. Once the pipe reaches freezing temperatures, the water inside the pipe also freezes and does so along the inner walls of the pipe’s tube. Once enough ice forms, two things happen simultaneously: first, the ice builds, forming an ice dam inside the pipe, which causes any moving water left in the pipeline to become blocked. This blocked water then begins to build pressure. 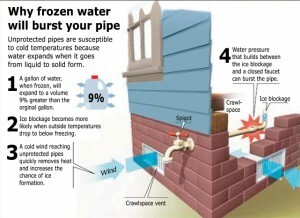 The second problem is the ice itself: ice expands as it freezes, forcing the pipe to weaken. With both kinds of pressure occurring at the same time, the pipe eventually gives out, causing a burst or break, which will result in needing restoration services. Use of RV anti-freeze. If your home is old or has consistent problems every winter with pipes that freeze, you may want to consider putting RV anti-freeze into the pipes. RV anti-freeze is explicitly designed for use with plumbing and heating, so it is non-toxic. 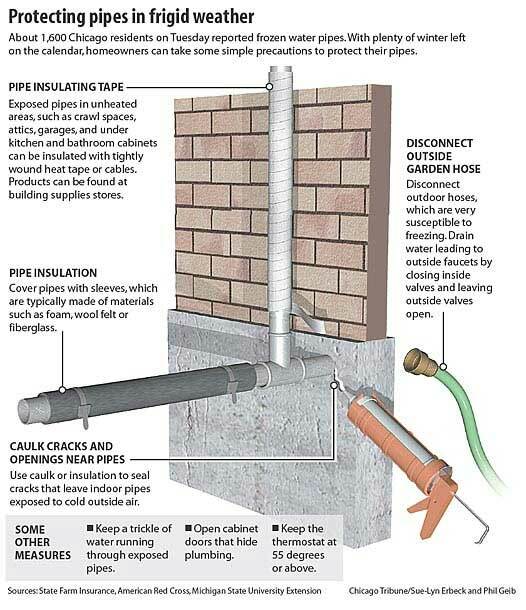 Anti-freeze can protect your pipes up to -50 degrees Fahrenheit during the winter months. Just keep in mind that only a licensed plumber should put anti-freeze into your system. In 2015, freezing temperatures made ice a massive problem for homeowners. A Tudor-style home in a Detroit historic home. The home located in the Boston-Edison district. 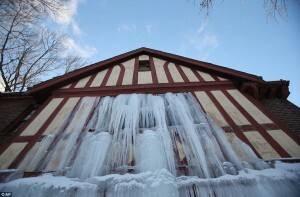 After frozen pipes burst, the house turned into an ice castle. The frigid winter and negative-degree temperatures made for a very destructive disaster. The water quickly froze creating amazing icicles that were as beautiful as they were dangerously destructive. The sheets of ice weighed down on the second floor so heavily that the ceilings crashed down into the first floor. What can be done to avoid and even prevent frozen pipelines, burst pipes, collapsed roofs, ceilings, and more expenses? Be proactive. Find all exposed pipes you may have and get them insulated. The best way to do this is to wrap the pipes with electrical heating tape, and then wrap the pipe with foam insulation. If you do not have heating tape, it is essential to at least put on the foam insulation. Maintain exterior faucets properly. As fall arrives, exterior faucets need to be cut off from the house water supply and be drained entirely to avoid trapped water freezing inside the pipe during winter. If you use an outdoor hose, disconnect the hose and drain the outside faucet to which it attaches. You can go one step further and purchase insulated coverings to help protect the outside faucets through the winter. Watch the weather. If you are aware of a severe cold snap coming, open any cabinetry that contains pipes that are part of an outside wall, such as in a kitchen or bathroom. For the duration of the cold snap, keep the cabinets open and run a trickle of water through those faucets, as running water cannot pool up and freeze. Make the call. Lastly, in the event you have a burst pipe or frozen pipes, call Rapid Recovery Service! Remember – prevention is always better than finding a remedy.